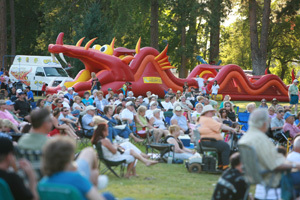 The Dragon Obstacle Course Can Handle Any Size Crowd. 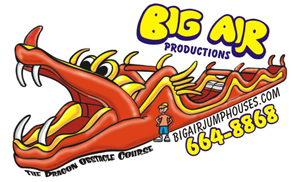 At 60' In Length, You Can Send Groups Of Children, Teenagers, Or Adults Through The Dragons Mouth!!! Dodging, Jumping, Sliding And Crawling Is The Only Way Out . 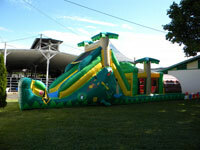 By Far The Dragon Is The Most Popular Inflatable We Have. It’s Shear Size Will Take Your Breath Away. Ready set go! This is what you will hear right before entering the All Star Challenge. After entering you will be adorned by obstacles to climb under, over, and through. Just when you thought the fun was over, you will get to slide through to the finish line. 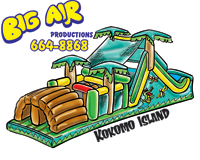 Kids and Adults of all ages are sure to have fun on Kokomo Island. 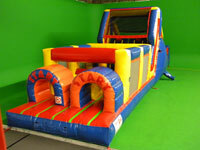 This giant obstacle course features a double entrance (great for time trials), and an 8' slide. Dodging, and crawling through the obstacles is the only way out. 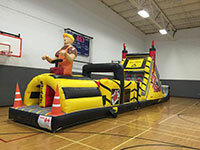 This inflatable obstacle course is great for accommodating large parties or events. Get ready to enter the Demolition zone. 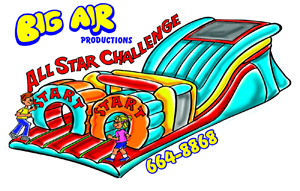 Race side by side through our 55' obstacle course. Be on the look out for caution signs, red tape, wrecking ball and construction themed graphics. 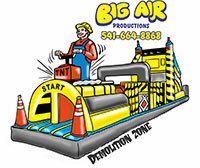 The Demolition zone is perfect for large crowds off all ages.